Piping with royal icing can be really tricky to get the hang off when you are first learning to decorate cakes. So, many cakers opt to use something called Cornelli piping which is a detailled and intricate piped design which even beginners can achieve. Pretty Witty Academy Guest Tutor Rachel Hill shows you how to pipe in Cornelli style. Cornelli piping is a line of royal icing that is continuous. You keep going as long as you can repeating wiggling and different directions. It is often used for wedding cakes but can be used for more informal designs as well. To make your royal icing whiter, add a little bit of Super White food paste colouring to it. 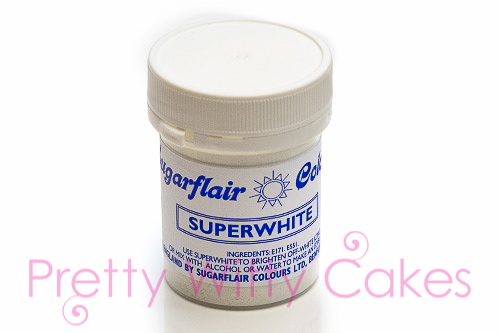 You can buy Super White from Sugarflair. Come and join 1000s of other members inside the Academy to see full length cake tutorials rather than small snippets!